Daniel Ellsberg Among Anti-War Protesters Arrested At The White House : The Two-Way On the same day that President Obama and his advisors declared that the United States is "on track" in Afghanistan, hundreds of anti-war protesters gathered outside the White House to voice their dissent. 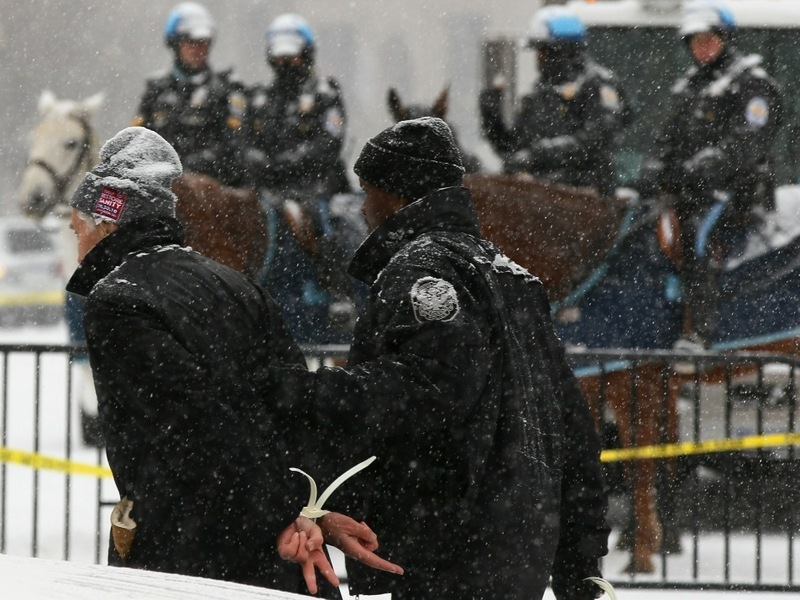 Daniel Ellsberg flashes two peace signs behind his back while being arrested during a snowy anti-war protest in front of the White House. On the same day that President Obama and his advisors declared that the United States is "on track" in Afghanistan, hundreds of anti-war protesters gathered outside the White House to voice their dissent. Among the protesters was Daniel Ellsberg, the former military analyst who in 1971 leaked the Pentagon's secret history of the Vietnam War to the press. At the rally today he spoke in support of WikiLeaks founder Julian Assange and Bradley Manning, the Army private suspected of leaking U.S. documents, for shining a light on U.S. policy and actions in Afghanistan. "I think they provided a very valuable service. To call them terrorists is not only mistaken, it's absurd." Ellsberg was later one of dozens arrested for failing to obey police orders to clear a sidewalk by the White House. Ellsberg said it was the 80th time he has been arrested.